The Arlington County Neighborhood Traffic Calming Committee (NTCC) has selected Little Falls Road and N. 27th Street as candidates for traffic calming during its fall funding round. The two streets are being considered as separate projects, and county staff has already held preliminary meetings with residents of each street to begin the planning process for each project. The Little Falls Road project runs between the Harrison Street and Yorktown Boulevard intersections. Daphne Lathouras has volunteered to serve as the neighborhood block captain. The county has assigned Betty Diggs to staff the project. She can be reached at 703/228-3202 and ediggs@arlingtonva.us. Traffic calming solutions under consideration include nubs at the Harrison and Yorktown Blvd. intersections, along with possible speed cushions. An open house has been scheduled for November 8 at 7:30 p.m. at the Yorktown High cafeteria to review solutions. Twenty-Seventh Street between N. Lexington and N. Harrison Streets has been selected by the NTCC under its expedited speed bump alternative. Therefore, speed bumps are the only traffic calming solution available for consideration by residents. Karen White has volunteered to serve as the neighborhood block captain for that project. Ron Hicks is the county staff member serving the project. Ron can be reached at 703/228-3691 or by e-mail at rhicks2@arlingtonva.us. An open house has been scheduled for Tuesday, October 19, at 7:30 p.m. at the Yorktown High cafeteria to discuss this project. 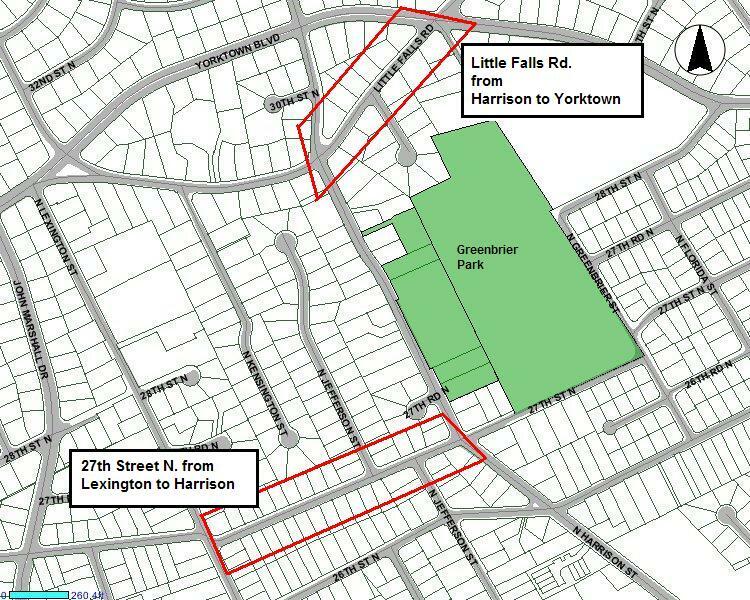 27th Street (west of N. Jefferson) is the boundary between the Yorktown and Leeway-Overlee civic associations so residents of that civic association are also involved in the project. Even though project solutions are developed by residents of each street, program guidelines require that 60% of affected residents sign petitions in support of the projects before funding will be approved by the county. Petitions will be circulated after each of the block meetings. Residents on adjoining cul de sacs are defined as “affected residents” and are also petitioned. Thus, all houses on the Jefferson Street cul de sac will be petitioned as part of the 27th Street project. Extra points are given to any project receiving civic association support, so there will be votes on each project at the YCA fall meeting on October 20. If the projects are approved by residents and the county, installation of speed bumps could be expected as early as mid-2005 with construction of other enhancements to follow at a later date.